The pürform food system has been developed for all residents and patients in aged care homes and hospitals and those living at home, who rely on puréed food, due to their age or due to difficulties in chewing or swallowing. The pürform food mould system has been developed for all residents and patients in aged care homes and hospitals and those living at home, who rely on puréed food, due to their age or due to difficulties in chewing or swallowing. With this system the food is first puréed before being returned to a form very similar to the original food by means of special thickening agents such as Gellan and Agar. If other additives are required they can be added at the thickening stage, before being poured into the moulds, such as cream, butter, maltodextrin, protein powder, etc. into the puréed food. Using the Pacojet2 system to process the puree, the result will be a filament free product that has all the nutrients in balance. 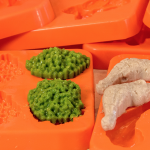 Something good is being served up today: Potatoes, vegetables, cutlets, chicken legs, sausages, fish fillet – our versatile silicone moulds return a great variety of foods to their natural, tasty form.